The Goodwood Motor Circuit was just two years old when its Daily Graphic-sponsored International race meeting was held on September 30, 1950. It would prove to be Goodwood’s first-ever event of genuinely nationwide significance. It held an importance far beyond the normally confined audience of real motor racing enthusiasts. The reason for that was the presence of Britain’s much-publicised great white hope for Grand Prix racing success – the 1½-litre two-stage centrifugally supercharged BRM V16. After too many years of promises and delayed development the car was brand-new then. Nobody knew that it would prove in essence to be almost as big an over-promoted flop as the floundering Government’s East African Ground-Nut Scheme – trying to grow peanuts in land entirely unsuited to the crop – or the Bristol Brabazon, the world’s largest airliner with multiple major drawback – its eight engines were piston radials, powering propellers, rather than jets, it was just too big, and not a single airline could see any possible profit from using it. The British public had been fed what would today be described as heavily-spun news majoring upon the “International prestige” to accrue from such grandiose dream projects, and when they fell flat on their faces politicians competed with one other to avoid any linkage with them. 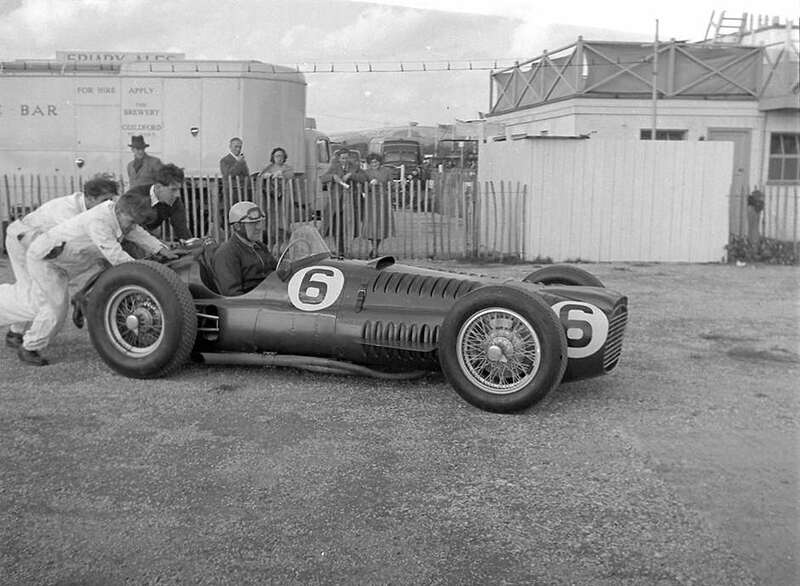 The same was going to happen to the BRM V16. After huge publicity over several years, the car had made its long-awaited, long-delayed debut in the ‘Daily Express’ Trophy meeting in August 1950. 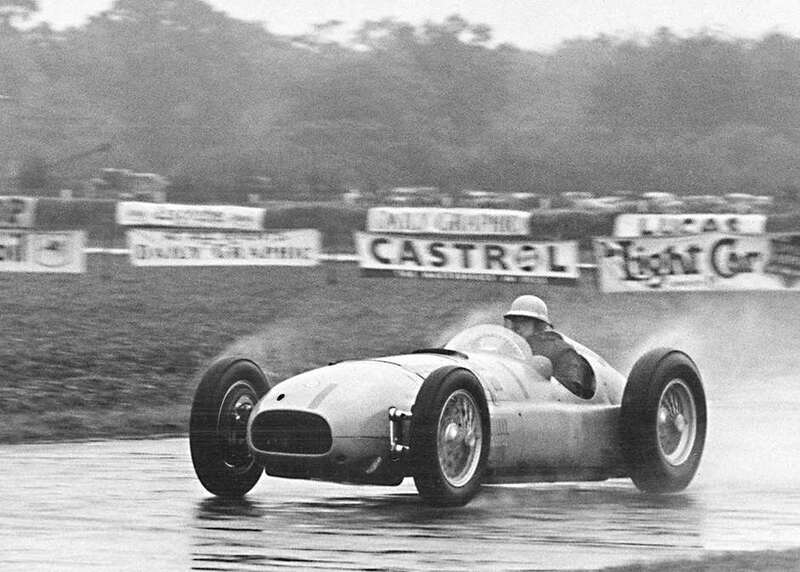 One car was delivered on race morning, having missed practice, for French ace Raymond Sommer to drive. He started from the back row of the grid, but at flagfall his BRM’s final-drive universal joint bodies both sheared as Sommer slammed home the clutch. The car just rolled forward a few yards, and died… The vast crowd groaned, then jeered. Back in the paddock pennies were thrown into its cockpit. Newspaper headlines screamed ‘FLOP!’ and ‘BRM – Blooming Rotten Motor’. 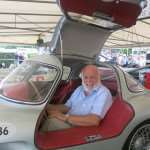 Project creator Raymond Mays and the cooperative industry British Motor Racing Research Trust needed desperately to regain public regard, to establish some credibility. 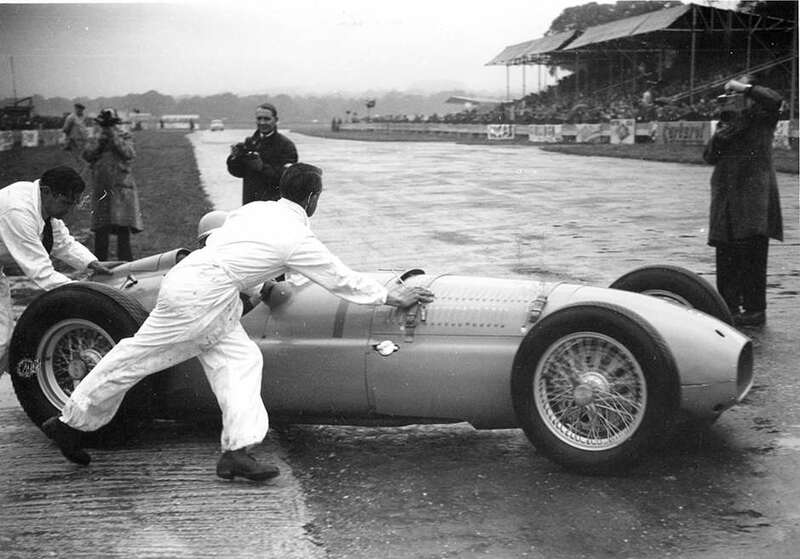 So both complete BRM V16s were prepared for Goodwood, and grizzled British veteran Reg Parnell was entrusted with the responsibility of driving. 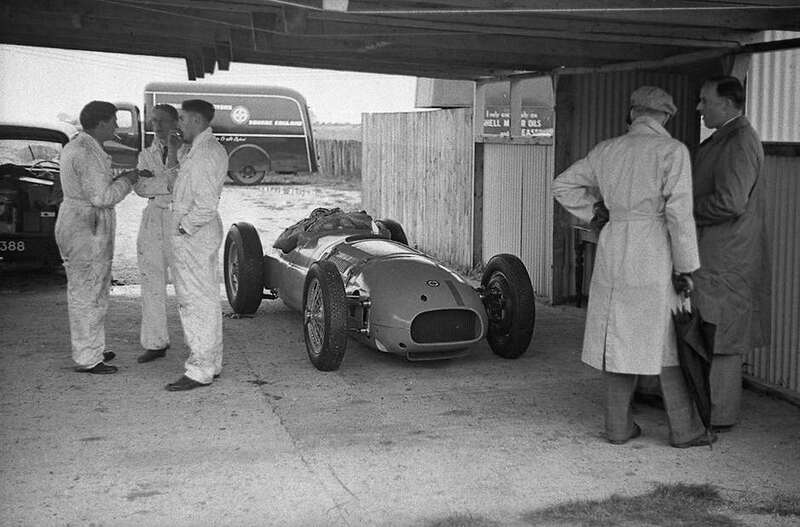 Practice period shot of the new BRM V16 – chassis ‘No 2’ – in shelter, team transporter in the paddock beyond. Race day dawned overcast. Steady drizzle became a downpour. First race was the Woodcote Cup for Formule Libre cars – just five laps, 12 miles. ‘Uncle Reg’ eased the clutch gently home – mindful of Sommer’s experience – but on the opening lap took the lead, splashing around our circuit, laving Prince ‘Bira’s Maserati 4CLT in its wake and winning at 78.5mph in the foul conditions. Parnell also set fastest lap at a brave 82.01mph. Robin Richards: ‘And I can’t see the BRM at the moment – there’s no sign at the moment, but I’m peering out through this haze – yes, he’s just in sight and he’s got quite a comfortable lead. He’s streaming down the straight now towards me and I can’t even see ‘Bira’; there’s a tremendous lead – he’s pulled nicely away in these last three laps. Just listen to him come by. He’s approaching me now. Listen…’ (noise of car). But this was a beginning for BRM, which the team took many years to emulate at World Championship Grand Prix level. Nonetheless, Goodwood had been the stage for a truly historic event – which put both BRM, and the Sussex circuit, squarely ‘on the map’.